I can’t tell you that I was able to give the Friday match at St. Pauli my full attention, but I managed to get it streaming to my television Friday while I was also the lone parent in a house with two young boys, one of whom had begun to voice his displeasure with the lack of Mommy in the house before 5 a.m..
Fortunately, my Effzeh-obsessed three-year-old was content to have the match on the television while he ran up and down the hallways of our home in his ‘Billy Goats shirt” scoring goals against imaginary opponents with completely made-up names. 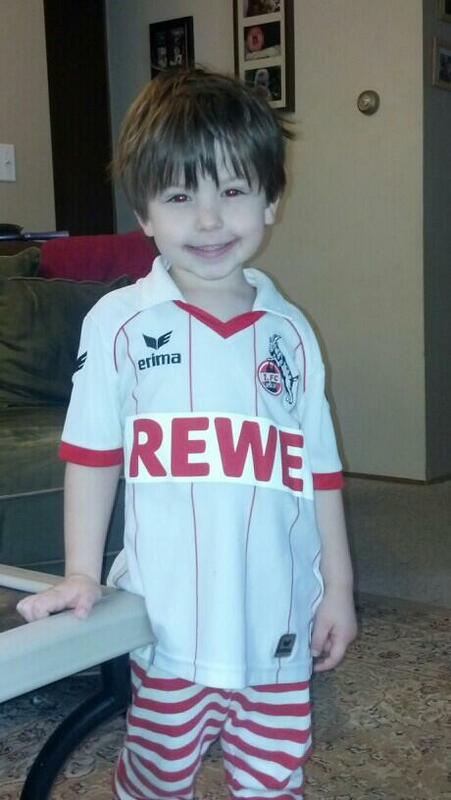 My son, the little FC Köln fan. Well, not entirely content, to be honest. I am frequently instructed to cheer “FC Köln! FC Köln!” as he bounces up and down in celebration of his own goals and to act as referee to talk to and/or card opponents who trip and push him to the ground. Much like many Bundesliga players, he believes it’s completely his place to tell the referee what decisions should be made at any given time. After scoring four goals in about five minutes, Owen declared it was his time for a call-up to the big team. “I think I should play in THIS game, Daddy,” he asserted while pointing at the TV screen. To be fair, the Billy Goats were stuck on just the one goal at the time. Despite being otherwise occupied, however, I did get to watch enough to see that the scoreless and winless streak was definitively being ended in the first leg of the two-match week in Hamburg. Three goals is a pretty good result, despite the fact there were certainly more to be had with St. Pauli loosening things up a bit in an attempt to close the 0:2 deficit and, later, when the home side went to ten men after a direct red card. Of course, St. Pauli also made the Effzeh defense work as hard as any opponent has so far this season. Of the several clean sheets for Timo Horn to date, none featured as many late saves by Horn or teammates in the box as did Friday’s match. I haven’t really discussed it in great detail with other fans on Twitter, but I, for one, am very glad to see the return of the two-striker attack, even if it looked like this at one point. It had become clear that the combination of Anthony Ujah and Patrick Helmes on the pitch was not as great as the sum of the parts. While nobody would expect an instant chemistry, I think it is fair to say the end result of having two of the most-talented strikers in the league playing together had fallen a bit further below even conservative expectations. It had been my idea for quite some time now that Ujah, despite scoring goals fairly regularly, would be insanely dangerous if he ever managed to unlock a better finishing touch. For every goal, there are at least two moments where you raise from your seat, preparing to launch into celebration of a sure-thing, only to sit back down with that “oh!” you involuntarily mutter when the opportunity evaporates. All Helmes has brought to the party is an uncanny knack for hitting aluminum. Does anyone track how many shots deflect off the goal frame? I’m guessing he’s averaging a pretty high number, considering it would seem to be more difficult to hit that than to actually get the ball in the net. I keep assuming that defenses are going to have to make some choices when both players are on the pitch, and I think we’ve seen some of that, but when both men run onto the same ball (and one of them was clearly offside and not the target of the pass), you definitely are making things easier for opponents. @GeissbockUSA sometimes it takes time. All that being said, I still like seeing both guys out there at once. I’d rather they find a way to work through their lack of chemistry in game situations than see a single-striker offense fail to get the chances. Without question, things are more thrilling when the attack is flowing forward for the Effzeh, even if the finishing isn’t quite there. Yes, I want to win, but I sure don’t mind seeing more action on the pitch. Yet, I fear it’ll be just one or the other for Tuesday’s cup match at Hamburger SV. While I’m not certain Stöger’s motivation the last few weeks had necessarily been the offensive firepower of Union Berliln, VfL Bochum, and FC Ingolstadt, it might very well be against the HSV, which has 31 goals in their 14 Bundesliga matches this season. But there is a risk-reward factor here. The more defensively you play to try to keep guys like Pierre-Michel Lasogga and Maximilian Beister off the scoring sheet, the less you are taking advantage of a defense that gives them up as quickly as their teammates can score them. Hamburg’s 31 goals allowed is not the league’s worst, but that’s only because Hoffenheim and their incredibly poor defense didn’t get relegated last year. I strongly believe the HSV is vulnerable, but I also think they’ll be out to prove their superiority and unlikely to take 1. FC Köln too lightly. Injury to Rafael Van der Vaart is definitely a break for the visitors, but it’ll be a few more breaks needed to spring the upset. It would also be helpful to not miss the chances that come, because they will come. Of that, I am certain. The HSV defense is completely suspect. 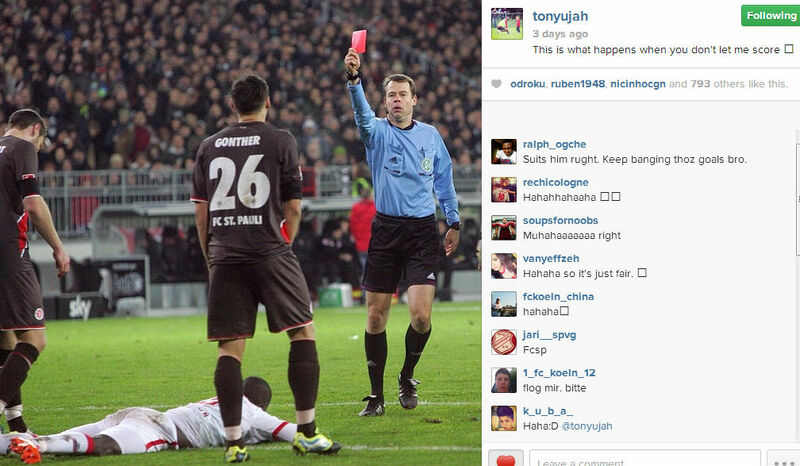 Red card for “not letting me score.” Ujah rules! I’m looking forward to watching the match and am even cautiously optimistic. Not sure I’d be quite so excited had the team not snapped out of the funk of the prior two league matches, but they have. And should this party roll on into the quarterfinals and the Effzeh spends Christmas in the Pokal…more Glühwein, bitte! Be the first to comment on "Helloooo Hamburg!" Happy 66th Birthday to the 1. FC Köln!